There are a wide variety of benefits to using security camera systems in order to protect your home. They are a huge deterrent to potential intruders – once would-be criminals see that there are cameras protecting your property, they are likely to move on for fear of being seen and caught. It is also easier to prosecute intruders that have been caught on camera in the unfortunate event that you are ever broken into. Home security systems also allow for remote monitoring, so that you can always keep an eye on your business or home when you are not there. We offer systems that can be controlled over the Internet with the use of your mobile phone or laptop, so you never have to worry that you are missing any unusual activity. You can also receive security warnings in advance from your security company if there is ever any suspicious behavior sighted at your property. This will allow you to take action before a crime is committed. 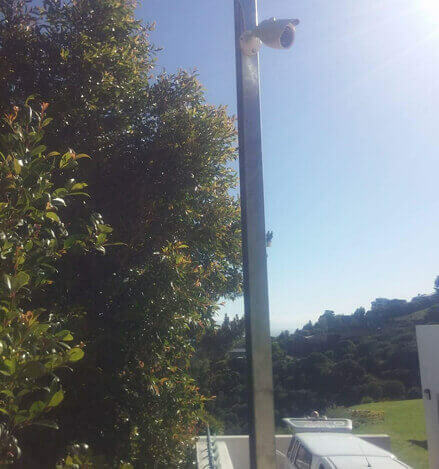 We provide a range of equipment that is required for CCTV camera installation. The cameras come in a variety of styles – the one you choose will depend on your specific needs. We also offer a range of lenses, so that your camera can be modified according to your desired view. The footage recorded by your system can be displayed on a monitor or LED screens. We also provide housing and brackets so that your cameras can be placed in the best possible positions. The best position will be protected from the elements, and also provide the most advantageous views of your property. There are a number of bracket types available, and our housing equipment is made of high quality materials so that it will last for years, and protect your camera from damage.